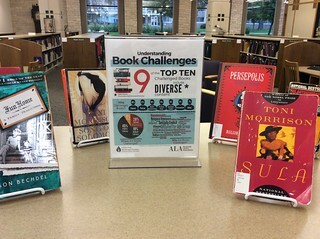 Banned Books Week display celebrating diverse books. 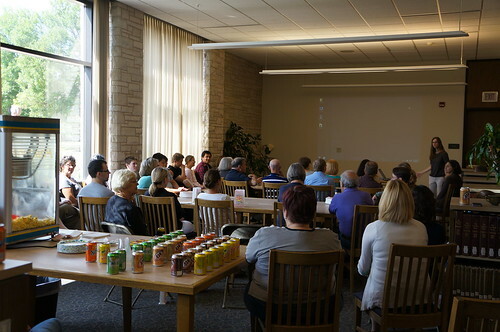 At a recent library staff meeting, we were honored to welcome Kimberly Barrett, Lawrence’s new Vice President for Diversity and Inclusion and Associate Dean of the Faculty. Vice President Barrett shared her vision for diversity and inclusion at Lawrence and helped us to discover ways in which the library can show the students, faculty, and staff that we are dedicated to celebrating and exploring diversity. September is National Hispanic Heritage Month. 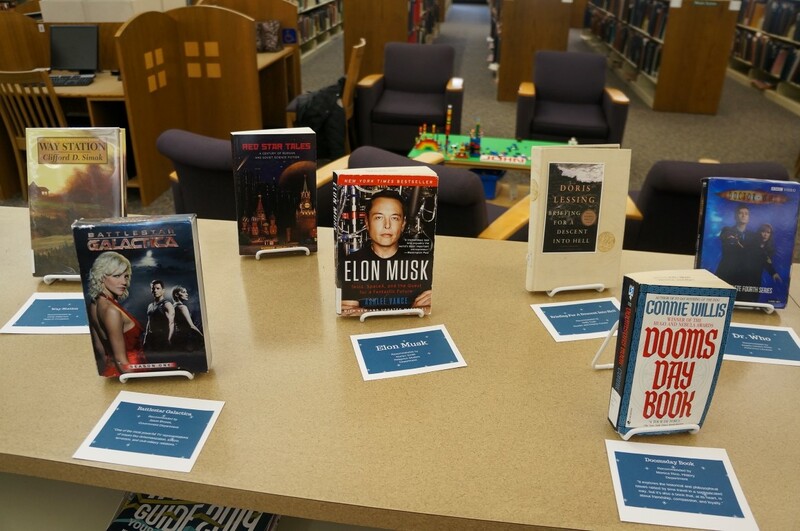 Is your department or student organization interested in collaborating with us on a library display or event? Fill out our form and share your ideas! Your friends in the Mudd Library are happy to be a part of the diverse and welcoming community of Lawrence University. Summer is a great time to learn about new, interesting things. With this in mind, the Mudd Library is happy to be hosting an exhibit as well as our annual coffeehouse series this summer. 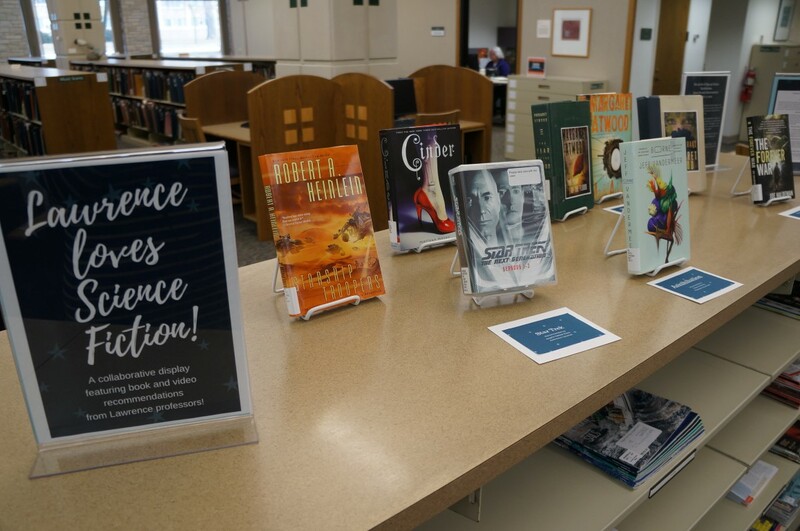 As always, we encourage everyone still on campus to stop in and check out our great selection of novels, non-fiction, and movies. Keep in mind, we have begun our summer hours of 8 a.m. to 4 p.m., Monday through Friday. The crowd listens at last year’s “Films from the Archives” coffeehouse. For just a few more days, the library will be hosting the exhibit, “A Stone of Hope: Black Experiences in the Fox Cities.” Learn more about this fascinating exhibit at the History Museum website, then stop in and see it for yourself. The exhibit will be on display through June 30th. We will also be hosting our annual summer coffeehouse series. 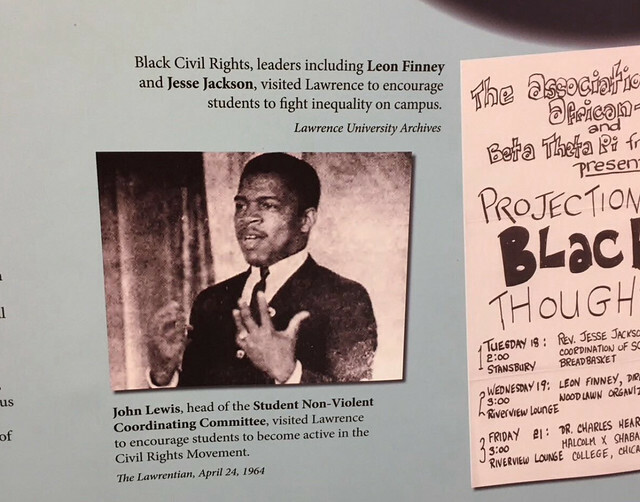 The first session is entitled, “Lawrence and Diversity,” and will take place on Wednesday, July 1 at 10 a.m. At this coffeehouse, Archivist Erin Dix will discuss the history of how fostering greater diversity and greater appreciation for diversity has been, and remains, a priority for Lawrence University. See our guide to learn more about this, and our other exciting coffeehouses. We hope to see you in the library this summer! The Mudd Welcomes James Zwerg and Congressman John Lewis! All of us at the Mudd are honored to welcome James Zwerg and Congressman John Lewis to campus this weekend. Each of these brave men will be receiving an honorary doctorate of humane letters degree at commencement on Sunday, where Lewis will deliver the commencement address. Meanwhile, we’ve expressed our admiration and appreciation by gathering some interesting and pertinent materials from our shelves together so that you, our wonderful patrons, can easily access these important works. We invite those of you wishing to learn more about the civil rights movement as a whole, as well as the integral role played by both Lewis and Zwerg, to stop by and delve into our resources. 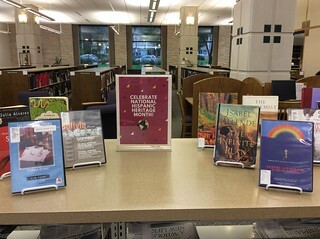 John Lewis’ award-winning memoir, Walking With The Wind: A Memoir of the Movement, is featured in our display and available for check out. His 2012 publication Across That Bridge: Life Lessons and a Vision for Change, which “draws from his experience as a leader of the Civil Rights Movement to offer timeless guidance to anyone seeking to live virtuously and transform the world,” is also available. Graphic novels are an accessible medium that present complex issues in a beautiful, artistic way, and the graphic novel March is a great example of this. It is “a vivid first-hand account of John Lewis’ lifelong struggle for civil and human rights, meditating in the modern age on the distance traveled since the days of Jim Crow and segregation. Rooted in Lewis’ personal story, it also reflects on the highs and lows of the broader civil rights movement.” Written in the format of a comic book, March is a great introduction to the intricacies of the civil rights movement, and Lewis’ role in it. 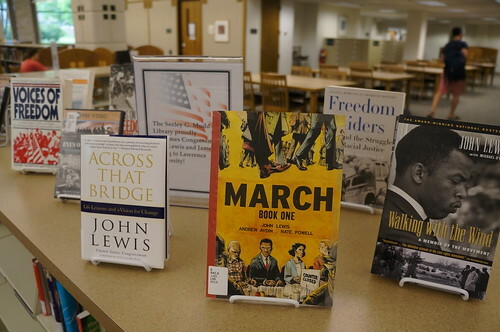 The display also includes several books expounding on the work of the Student Nonviolent Coordinating Committee (SNCC). Lewis founded the SNCC and Zwerg joined shortly thereafter. To learn more about this organization, check out A Circle of Trust. For a feminist perspective, we are showcasing another important work: Hands on the Freedom Plow: Personal Accounts by Women in SNCC. If you’re interested in the Freedom Riders, our Archivist has created a display featuring moving images of the riders in action, as well as local newspaper articles from the time covering the movement. One chilling photograph shows Lewis and Zwerg, both bloodied, after an 1961 attack in Alabama. To learn more about the significance of the Freedom Rides, the DVD Freedom Riders is available, as is the book Freedom Riders: 1961 and the Struggle for Racial Justice. For a sweeping and comprehensive view of the civil rights movement as a whole, check out Eyes on the Prize: America’s Civil Rights Movement, a 14-hour documentary covering the movement from 1960 to 1985, available as a series of DVDs. We also have the documentary’s companion book, America’s Civil Rights Movement, for deeper exploration. Please join us in welcoming James Zwerg and Congressman John Lewis to campus! Stop by the Mudd to learn more about the work and achievements of these men before they arrive. You are sure to be inspired by their courage.